Myopathy is a muscular disease that causes muscular weakness. Rhabdomyolysis is a very specific type of myopathy, the rapid break down of skeletal muscle due to muscle tissue injury. The broken down material can be released into the bloodstream and may cause acute kidney failure. Signs and symptoms for myopathy include unexplained muscle fatigue, muscle pain, tenderness and an elevation of a muscle enzyme in the blood (creatine kinase). Rhabdomyolysis is often characterized by fatigue and dark or red urine, in addition to the symptoms of myopathy. In the trial (known as SEARCH), patients taking an 80mg dose were compared to patients taking a lower 20mg dose. 52 patients taking the higher dose developed myopathy, compared to one patient taking the lower dose. Eleven patients taking the higher dose developed rhabdomyolysis, compared to zero patients taking the lower dose. We support the FDA’s recommendation that patients continue taking their medication as prescribed by their physicians, and that patients speak to their physician if they have symptoms or questions. Muscle pain or weakness in people taking simvastatin should be reported to a doctor because these could be signs of a serious side effect. Doctors may perform blood tests before and periodically during treatment with simvastatin to check for liver problems. People taking 80 mg of simvastatin should receive an additional liver function test at three months. Indications and Usage: Dose range is 5-80 mg/day. Warnings: Skeletal muscle effects (e.g., myopathy and rhabdomyolysis): Risks increase with higher doses and concomitant use of certain CYP3A4 inhibitors, gemfibrozil, cyclosporine, danazol, amiodarone, and verapamil. Predisposing factors include advanced age (65 or older), uncontrolled hypothyroidism, and renal impairment. Myopathy/Rhabdomyolysis: Simvastatin, like other statins, occasionally causes myopathy manifested as muscle pain, tenderness or weakness with creatine kinase (CK) above ten times the upper limit of normal (ULN). Myopathy sometimes takes the form of rhabdomyolysis with or without acute renal failure secondary to myoglobinuria, and rare fatalities have occurred. The risk of myopathy is increased by high levels of statin activity in plasma. Predisposing factors for myopathy include advanced age (≥65 years), uncontrolled hypothyroidism, and renal impairment. As with other statins, the risk of myopathy/rhabdomyolysis is dose related. Zocor is made of simvastatin, which is a component in Vytorin and Simcor, and is sold in generic form. We’ll continue to track the increased Zocor injury risks. 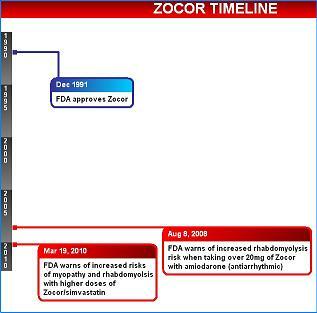 I really believe a Zocor recall or withdrawal is coming down the pike at some point. Update: our lawyers are now taking these case. Get a free consultation here.